The UN General Assembly votes on and adopts resolution on the Protection of the Palestinian civilian population. In an emergency meeting on Wednesday, the United Nations General Assembly adopted an Arab-sponsored resolution calling for greater protection for Palestinians, and deploring any use of “excessive, disproportionate and indiscriminate” force by the Israeli military against Palestinian civilians, particularly in Gaza. The resolution was adopted by a vote of 120 in favour, 8 against, with 45 abstentions. After several rounds of procedural voting, and delays over tallying votes, the US text secured the support of 62 countries, with 58 against; coming up short of the two-thirds majority needed. Ambassador Nikki R. Haley of the United States addresses General Assembly on the "Illegal Israeli actions in Occupied East Jerusalem and the rest of the Occupied Palestinian Territory". “It is totally one-sided. It makes not one mention of Hamas, who routinely initiates violence in Gaza. Such one-sided resolutions at the UN do nothing to advance peace between Israel and the Palestinians,” she said. “We therefore firmly reject the bad-faith attempt to insert an amendment that would radically unbalance the text and shift the Assembly's focus away from the core objective of protecting civilians and upholding international law,” he said. Riyad Mansour, Permanent Observer of the State of Palestine to the UN, addresses the resumed tenth emergency special session of the General Assembly. 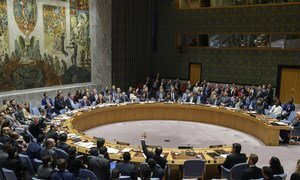 The United Nations Security Council on Friday failed to adopt two competing draft resolutions; one produced by Kuwait, in response to the killing of dozens of Palestinian protestors in Gaza, and the other tabled by the United States, which vetoed the initial resolution saying it was “grossly one-sided” against Israel.